You might wonder whether a relatively small campus and student body would need a tool like SpaceScout — wouldn’t students discover available study spaces on their own, and quickly? Not necessarily: Bothell is quickly outgrowing its historically small stature. Tim Rhoades, Director of Operations for UW Bothell Information Technologies, cites impressive statistics: “Bothell is the fastest growing campus in Washington State, and the fourth fastest in the nation. Over the past six to seven years, the student body has grown 150% (from 1800 to 5000 students). We have heard estimates that within the next five to seven years we will be at 7500 students.” Such rapid growth leads to rapid changes in available space: new buildings are leased, older buildings must be refurbished (which may leave them unusable for a time). In late 2013 members of the SpaceScout team–Janice Fournier, Research Scientist, and Lauren Manes, User Experience Designer–reached out to Bothell colleagues Tim Rhoades and Chelle Batchelor (Research Librarian and Head of Library Access Services) to explore creating SpaceScout for UW Bothell. Although Tim and Chelle were keenly interested, a new building was breaking ground and it made more sense to wait until that space was completed before bringing Bothell into Spacescout. 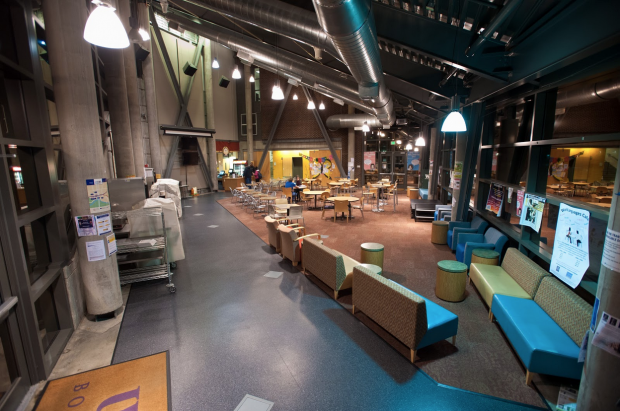 Soon after the new building was completed (in Fall 2014), concern from the students, voiced by the UW Bothell Student Senate, moved SpaceScout high on the campus priority list. With another new building breaking ground and continuing growth of the student population on campus, students wanted help in finding places to study. Bothell’s new Discovery Hall houses the School of Science, Technology, Engineering and Math and maximizes space beyond classrooms and labs for planned and impromptu study sessions. With this request from students, Tim Rhoades, who managed the Bothell SpaceScout project, assembled the interested staff: Chelle Batchelor; Amy Van Dyke, Director of Physical Planning & Space Management; and Amy Stutesman, Administrator for UW Bothell/Cascadia Library. Amy Stutesman and Chelle gathered data for the libraries, while Amy Van Dyke performed that service for the other UW Bothell academic buildings. Mark Studer, the UW Bothell Campus Photographer, created many of the beautiful images. Stacy Fullwiler curated the images. Bothell staff benefitted by being the third campus to come online with SpaceScout. By the time Bothell and UW-IT began collaborating, the SpaceScout team had gained insight from creating SpaceScout for Seattle and Tacoma. “It was a process of learning, getting smarter about how to gather and upload data,” said Lauren. When first developing the tool, the SpaceScout team did the (literal) leg work themselves, going out to buildings all over campus, taking photos, collecting information about available outlets, whiteboards, printers, proximity to food and coffee, and ambient light and noise, checking and re-checking data for the 250 spaces that now populate Seattle SpaceScout. When consulting with other institutions considering SpaceScout, Janice and Lauren convey the importance and value of defining spaces. “People don’t normally think about ways to account for their informal space or how to ensure that they have a variety of spaces that meet student needs.” Going through the inventory process required to create SpaceScout gives an institution a way to say, “we have X number of lounges, Y number of study rooms,” and so on. “One of the things we learned when we worked with our Tacoma partners (Darcy Janzen, E-Learning Support Manager, and Tim Bostelle, Head of Library Information Technology) was how well our taxonomy of space types fit a different campus. 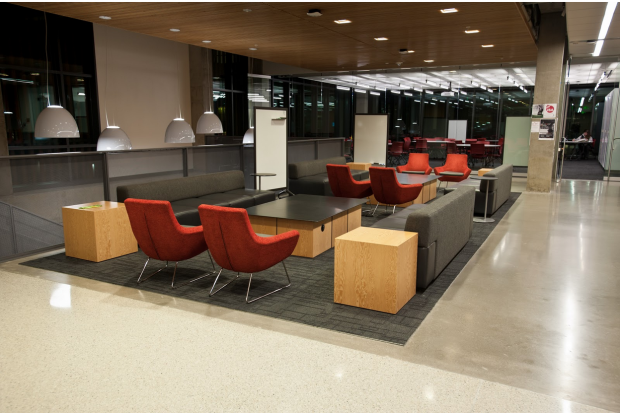 When you look up spaces on the Seattle campus, you won’t find photos of benches in a hallway, because the students who worked with us on the app didn’t consider these study spaces. On the Tacoma campus, this was different. Lauren and I saw students studying in every available space. We also learned a lot in working with the Tacoma staff that helped us to solidify our naming conventions. The Beardslee Building is one of UW Bothell’s leased buildings, offering spaces for individual and group study. Amy Van Dyke adds, “With the growth of campus, study spaces are getting full! SpaceScout can help students find alternative spots. For example, we have a couple of leased buildings that are adjacent to campus — students can reach them on foot in under 10 minutes — that aren’t as heavily used. Putting those spaces on SpaceScout gives them more visibility.” SpaceScout also helps students discover resources, such as computer labs, that are available to them but that they might not otherwise know about. Not surprisingly, the Bothell team were already quite familiar with the spaces prior to starting the work on SpaceScout. The primary task, then, was collecting information about accessories and amenities. For the library spaces, the work required two walk-throughs, about three hours of defining spaces, thinking about how they wanted to represent the spaces, and collaborating with Janice and Lauren to standardize terminology. For spaces beyond the library, Amy Van Dyke estimated that the work took about eight hours. Filling out the spreadsheet prior to the walk through was key. Members of the Bothell team reflected on what they learned during the SpaceScout work. Sometimes it was a small but critical realization, such as the necessity of all spaces being numbered, or consistent naming (to which students contributed). The most interesting challenge was learning to think about spaces as students might see them. For instance, a very large area next to the library reference desk contains a study space with tables, an adaptive technology workstation, an area with 50 computers, and another space without tables. It’s important to visually and conceptually define these areas so that students intuitively know how to use them to their advantage. Lauren praised the Bothell staff’s ability to get the work done quickly. 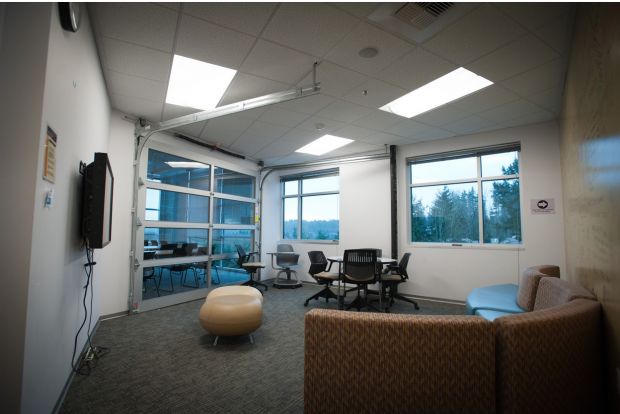 Janice added, “They did an incredible job — collecting complete data (including making decisions about what to include and how to name spaces) and photographs on 70 spaces in a matter of weeks.” They both noted the Bothell staff’s creativity in maximizing space that might have gone unused. Amy Van Dyke referred to these as “interstitial spaces” — spaces adjacent to elevators, at the ends of hallways, and outside of classrooms and labs that can be transformed into study spaces with the addition of a few pieces of comfortable, useful furniture. 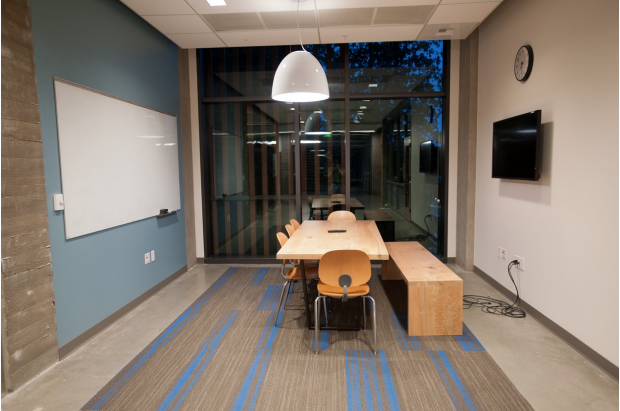 UW Bothell Discovery Hall, 4th Floor: Space that might otherwise go unused is turned into a study space for groups with the addition of a few amenities, including a table and bench made from locally sourced timber, and a view that turns the study space into a virtual treehouse. The team also worked to define multi-use spaces, such as the large area of the Commons. By suggesting different areas with the placement of different types of furniture, a large space becomes defined into smaller functional areas that can support a variety of activities and uses. Different types of furniture maximize the activities in and uses of a space, creating comfortable, temporary study space for students in between classes. For a predominantly commuting student body, spots where they can touch down for a quick study session are particularly important.